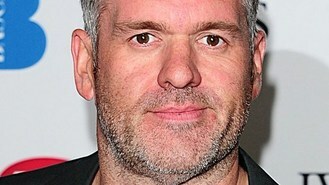 Chris Moyles has recorded a track with chart stars Rizzle Kicks. The outgoing Radio 1 breakfast host told listeners he had joined the band in the studio to create the knockabout track in which they exchange banter, poking fun at each other's ages. The Mama Do The Hump hitmakers were also guests on his show today as DJ Chris hosted his penultimate breakfast slot in front of 200-plus listeners at the BBC's Radio Theatre. Chris, 38, was welcoming a series of special guests on the show and his team presented a series of video montages looking back at his period of more than eight years in charge of the prestige morning show. Talking about his track with duo Rizzle Kicks, he said it was supposed to feature a series of joking insults which they traded about their relative ages. But he said he struggled to think of any appropriate put-downs for the pair who are both 20 years old. Recalling the recording he said: "'You're so old that you're in black and white', or whatever - and I go 'you're so young...' There's no you're so young jokes. "For literally 10 minutes, they ripped me to pieces - 'you're so young you've never heard of Morecambe & Wise'." Chris - one of the corporation's highest paid presenters - joked that his departure would leave a huge hole in the schedules, but would save the BBC a huge amount of money. Other guests on the show included Ant and Dec, who hosted a spoof edition of This Is Your Life. Led Zeppelin are to tour cinemas - as a film of the rock veterans' one-off reunion concert gets a movie release. Gareth Malone has joined an army of military wives as their ranks swelled to more than 600 for the launch of their new album. Plan B could be taking a break from the spotlight. Lady Gaga has unveiled a new shaved head look on Twitter. Rihanna has taken a leaf out of ex Chris Brown's style book - by donning a metal teeth grill. Gareth Malone has said he won't be taking on The X Factor again this year. Kanye West has not released a solo album since 2010, but the rapper has kept relevant with another strong year. Plan B and past nominee Richard Hawley are joint favourites to win the Barclaycard Mercury Music Prize as the shortlist of 12 was announced for the highly-valued award. Madness have drafted in Sgt Pepper artist Sir Peter Blake to design the cover of their new album.